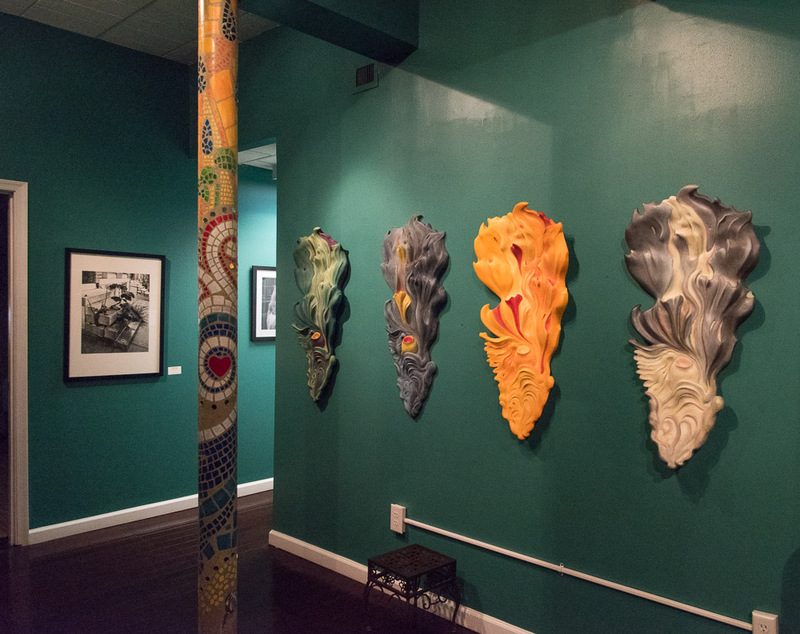 My painted wall sculptures explore the boundaries between categories, which is where the possibility for transformation comes into being. In these transition zones, traditional dichotomies dissolve between painting and sculpture, plant and animal, organic and inorganic, human and non-human. I foster paradoxes, seeking the precise point at which something is both familiar and strange, straightforward but mysterious, playful yet unsettling, cartoony while elegant. I seek to blur the boundary between object and observer: these sculptures are not illustrations of nature, but actively involve the viewers in a dynamic process of discovery as they develop a personal interpretation of what they see. Sculptures and more information below. Background: My source materials include direct observation of plants and animals, antique scientific illustrations of biological forms, and observations of fluid forms such as moving water or clouds. I have typically combined these nature-based motifs into new morphologies at once reminiscent of my source material, but unfamiliar, in that they cannot be readily identified or named. I have also been influenced by ideas from chaos and complexity theory that look at diverse natural phenomena and find that while such systems proceed according to general rules, they are never entirely predictable owing to a myriad of subtle interactions. I'm particularly interested in the characteristic movements found in all flowing media: for example, rhythmic waves, vortices, spiraling movements and meandering curves. These currents of movement can be said to have surfaces and three-dimensional form, even if those forms are too fleeting to be closely observed before they change, for example the surface of moving water, or a spiraling curl of rising smoke. Advances in science have heightened our awareness of constant change, that stability is an illusion, and that the reality we live in is being replaced moment by moment. I've come to see all artwork is in some sense analogous to the dynamical systems posited by chaos and complexity theories -- that is, an artwork takes shape within particular conditions of time, place, medium and the artist's own hand and sensibility, and unfolds as these forces interact. I'm looking for forms that directly evoke the free associative aspect of the creative process. Process: The process of realizing these works in three-dimensional form begins with sculpting the pieces in plasticine, a non-drying clay. While I start with a general configuration, the piece proceeds spontaneously and unpredictably as I add and remove clay in my search for the enigmatic zone where it takes on a form that looks both surprising and inevitable. I then make polyurethane molds and cast them in a polymer-modified gypsum compound strengthened with fiberglass strands, which dries to a stone-like finish. I also paint the casts, alert to how the color choices reinterpret the form. The only sculpture made by a different process was Rise, which was generated by a displacement map applied to a photograph of a cloud formation which "inflated" the flat image into a 3D file. The file was carved on a CNC router in high density urethane. The rest of the process was the same as outlined above: a mold was made and the sculpture was cast in polymer-modified gypsum and painted, a permanent image of an ephemeral form.